Congratulations to my dear wife.! Hear ye! Hear ye! New e-book published! 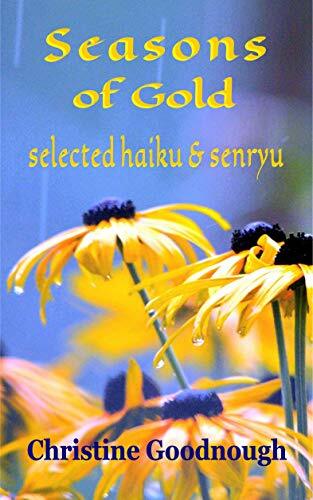 Seasons of Gold selected haiku & senryu, is now live on Amazon and I’m “over the moon.” Inserting the images has given me grief galore, but I’ve just viewed a copy on our tablet — and it looks great. Now to tell the world, “My e-book is ready for you!” A great way to celebrate National Poetry Month. Feeling a bit groggy this morning? Maybe you should move to Saskatchewan. We ditched Daylight Saving Time more than 50 years ago. More and more studies are demonstrating just how useless is this business of turning the clocks ahead one hour. It does nothing to reduce energy costs, which has been its stated purpose from the beginning. What it does do is cause more heart attacks, strokes, accidents and depression due to sleep deprivation. Numerous studies show that tomorrow and throughout the coming week there will be a statistically significant uptick in all the unfortunate phenomena just mentioned. Don’t listen to those who say it must be right because everybody is doing it. India, China, the Philippines and South Africa have stopped doing it, leaving Europe and most of North America as thee main practitioners of this bizarre practice. Isn’t it time they saw the light and dropped it, too? I wish I had written this. Like the young lady who wrote this article, I wish to portray to people that Mennonites are “quite dreadfully ordinary.” I am a more or less normal Canadian guy who became a Mennonite 40 years ago because I believed the Mennonite faith to be the most authentic expression of genuine Christianity. I was not raised in a Mennonite church and have never been enamoured of the “Mennonite culture”. Though by now I have grandchildren who are pretty much part of that culture. This post comes out of a commitment I made to myself shortly after I started this blog. But to understand why, I need to tell you the beginning. I had sought to publish some short articles through Mennonite publications, but the lists of prerequisites of what is and is not okay to put in said articles was discouraging. In addition, in telling true stories about ourselves, we run the risk of threatening someone else’s privacy. Blogging looked attractive in that no one had to know me or the people I was writing about to appreciate my writing. I wondered if people who didn’t know me could actually find me interesting to read. In school we learned poems about log drives in Quebec. Loggers worked all winter in the forests and in the spring the logs were floated down the rivers to the paper mills. That is history, nothing but folklore anymore. There are still lumber mills; there are mills producing tissue paper, computer paper, glossy magazine paper, but the logs are all hauled by truck. And the last newsprint mill in Quebec is closing. I suppose I am part of the problem. I’m still pretty much a news junkie, but I don’t buy newspapers anymore. I read them on my cell phone. Now I can read the daily newspaper from our nearest city, a national English language newspaper, a national French language newspaper, a newsmagazine from France, a provincial French language weekly newspaper, pretty much anything I want to read is available to me on that little device in my pocket. Paper newspapers are getting thinner, some have died, more will die. Montreal’s La Presse, the largest French language newspaper in North America, does not use paper anymore. It is all available on the internet, and only on the internet. Think of the money that is saved in the cost of paper, ink and distribution. Not only that, but its reach has greatly expanded. Paper copies of la Presse were never available here in Saskatchewan, unless you wanted to pay for a mail subscription. But then the news would always be stale. And don’t let me get started about the reliability. or lack thereof, of our postal system. Now the news is constantly updated and available to anyone with a cell phone. The Saskatoon Star-Phoenix will not longer deliver paper copies to rural areas. That’s fine, it’s right here in my pocket on my phone. The National Post ceased distribution of paper copies in Saskatchewan a few years ago. No problem. I can’t find l’Eau Vive , a weekly newspaper printed in Regina, anywhere in Saskatoon. I don’t care if they never print another copy, it’s so much handier to read it online. Moose Jaw is the old home base for our family and I am still interested in what goes on there. The Moose Jaw Times-Herald ceased publication last year after 112 years of daily publication. There is still a bi-weekly newspaper, but something even better has appeared – the Daily Jaw, an online newspaper. I’m an old guy, old-fashioned and resistant to change. But paperless news is change that I like. It is cold here, many mornings the wind chill has been -40° or worse. School has been cancelled numerous times as school buses do not go out when it gets that cold. Monday the temperature got up to -18° (that’s 0° Fahrenheit) and it felt positively mild! Our two cats don’t like this weather any more than we do. They want to go outside, but even when they do gather up enough courage to do so, they don’t stay out long. Each has chosen his favourite nesting spot in the house. Angus gets up on the washing machine. It’s located in the hallway in the centre of our house and he expects some attention every time one of us passes by. Pookie likes it under our bed. The floor is carpeted and there is floor heat. He finds it nice and snug there, protected from drafts and warmth seeping up from below. Sunday we were invited to friends from our church for dinner. It was sunny and I noticed a couple of cats outside. I think they spend nights in the barn. I should have counted the cats when we left, because when we got home there was a piteous wail coming from under the hood of our car. By the time I got a dish of cat food and went back outside the wailing had stopped. I lifted the hood and there was an orange tabby comfortably ensconced on top of the air cleaner. He jumped out as soon as he was exposed, but didn’t go far. He looked around this strange yard, trying to figure out where he was then ate some of the cat food. His owners showed up shortly thereafter to take him home.